What's the chemistry behind salt? 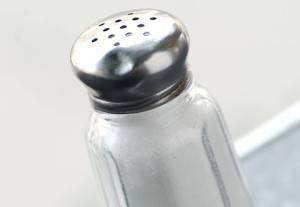 The salt we use in our food is an astonishingly useful chemical called Sodium Chloride – and did you know it’s actually a crystal? If you look at salt under a microscope, it would look like a mass of tiny boxes. Very pretty – and useful too. We often use salt to give food a certain taste – like when you put it on your chips! Not too much though, or you can end up ruining the food’s natural flavour! It’s also an antibacterial, which means it kills bacteria. Bacteria can cause our food to decompose – which isn’t good! So salt is a useful way of preserving food, such as storing foods in salty water called brine that helps keep the bacteria out. Or if you pack meat with salt, this draws out the water which bacteria need to live. This process is called dry curing, and tasty ham is made this way. Must have been tricky to put in your purse!